Rajasthan is a magical state which is, exhilarating, fascinating and unforgettable. You are thrown back in time and you will wander with delight throughout your journey. You navigate between the Middle Ages, the world of chivalry and the current modernism. There were sumptuous palace of Maharajas unbounded luxury, fortified cities, stone lace temples and villages lost in the middle of nowhere. Then this wonderful palette of colors that dot the region, its landscape from desert sand to Araveli mountains, woodlands and lush, colorful towns of blue, pink, yellow. Finally, there are men in exclusive turbans, proud to be Rajputs and majestic women in their colorful saris they wear with such ease and elegance. Do not forget its many colorful festivals, its lively music and beautifully adorned elephants. It never comes back exactly the same for such a trip. Sometimes called the Little Tibet - Ladakhis of Lamaist Buddhist tradition have welcomed many Tibetan refugees -, Ladakh is famous for its mountain scenery and Tibetan Buddhist culture. Its largest city is Leh. Grandiose region made of the highest peaks in the world, it has an average elevation of 5300 m. Population concentrated along the Indus, the king of rivers, and the few streams that flow into it perpetuates an ancestral way of life. Just walk away from a stone's throw from the main road to walk for days without seeing other than a sheep, raptors and small wild horses. South India is the empire of tempes, beaches, devotion and fragrances. Beautiful landscapes with bright colors, tropical vegetation, rice fields and beaches of sight. It is also the land of spices where pepper and cinnamon compete with cardamom and ginger. It's that mix of great Dravidian temples of Portuguese and Dutch churches and synagogues. Its spicy cuisine fragrant rice tickles the taste buds and delights the palate. Gujarat is a region little touristy but still offers many attractions. Starting with its rich culture, traditions and way of life of its inhabitants. A unique experience through villages where the colors of saris mingle with smiles of the poeple. The state of Gujarat has a rich heritage as diverse as its varied landscapes, vast palaces and crenellated forts without forgetting its beautiful countryside. Located on the eastern coast, Odisha is not much developed like other states of India but it has a great culture of architecture, music and devotion. It is inhabited by numerous tribes that have preserved their artistic and craft traditions in spite of Mughal and British rulers. The Odisha has been the cradle of many religions, it saw the advent of Hinduism, Buddhism and Jainism, which, despite their differences, are part of the great pantheistic religions of India. The Odisha is bordered by the Bay of Bengal to the east, Bihar and West Bengal to the north, west Madhya Pradesh and Andhra Pradesh in the south. Little tourist area, it still deserves a visit: beautiful temples, vast beaches, lakes, jungle, inaccessible tribal elders prestigious Buddhist sites, etc. Andaman and Nicobar Islands are located 800 km south-east of India, off the Burmese coast and 150 km of Indonesia. Their territory has nearly 570 islands, inhabited by hunter-gatherers, the Jarawa people threatened with extinction. Beautiful emerald waters, white sandy beaches surrounded by primeval jungle and mangrove forests, a population with an unusual cultural mix, the Andaman and Nicobar meet the expectations of the most demanding connoisseurs of pristine beaches, unspoiled nature and real tranquility. The south of the archipelago, the Nicobar Islands, remains closed to tourists. Uttarakhand is a state bordering Tibet to the north-east, Nepal southeast and is adjacent Indian states of Himachal Pradesh and Uttar Pradesh (of which he was seconded). It's name is derived from Sanskrit and means "country of the North". The area is known for the beauty of its landscapes. Most of the North of the state is covered by the Himalayan mountains and glaciers, while the Southeast is heavily forested. Two of the major rivers of India, the Ganges and Yamuna, originate in the glaciers of Uttarakhand. The area also houses several Hindu shrines of the most sacred and for two thousand years, pilgrims visit the temples of Haridwar, Rishikesh, Badrinath and Kedarnath hoping to cleanse their sins and seeking salvation. Washed by the Arabian Sea and the Bay of Bengal, India is a vast peninsula terrain varied: Himalayas in the north, the Thar Desert in the west, rolling plains along the Ganges, the Deccan Plateau in the south. Border with Pakistan, China, Nepal, Bhutan, Bangladesh and Burma, India is somehow the border between the Middle East and Southeast Asia. With over one billion people, India is now the second most populous state in the world. The country is predominantly rural and more than 700,000 villages are so far listed. However, there are also some overcrowded megacities in this country such as Delhi, Mumbai, Chennai and Kolkata. Hindi is the language of majority of the population but other 18 languages are written and spoken along with 1,600 dialects. English is widely used, including between the Indians themselves. The vast majority of Indians are Hindus. More than a religion, Hinduism is also a socio-religious system in which society is divided into hereditary and hierarchical communities: the castes. There are also Muslims, Christians, Sikhs, Buddhists, Jains, Parsis and Jews. The holidays are very numerous because of the diversity of region. January 26: The Republic day of India gives rise to important events. In Delhi, at Rajpath, a ceremonial parade by the Indian Armed Forces with elephants and camels. January-February: Desert Festival in Jaisalmer, a spectacle that takes place in the middle of the dunes and leaves even the greatest travelers dazzeled. February-March: Holi is the most exuberant Hindu festivals. It is celebrated at the end of winter by throwing water and colored powders. July-August: Festival of Teej in Jaipur to celebrate the advent of the monsoon. Essentially feminine, you can see women dressed in their finery. October-November: Diwali, the most joyous celebration, the festival of lights. It celebrates the return from exile of Rama and is dedicated to Lakshmi, Kali and Krishna, and all the homes are decorated joyfully. November: Pushkar Fair, a large camel and cattle fair which takes place for 7 days and is the most famous of Rajasthan. Pushkar becomes seven days a gigantic camel fair. 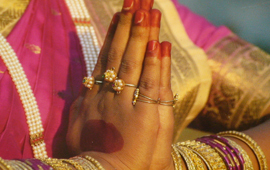 Greet someone by saying "Namaste" with hands folded under chin. Indians show their approval nodding of the head, which can be taken at first for a no. People usually do not see a downside to being photographed. However, make sure to ask them in advance. Since October 1, 2008, smoking is prohibited in public places, under penalty of fine. It is mandatory to remove their shoes at the entrance of some temples. Better to wear the shoes which are easy to remove and wear. We do not touch the head of a child. We do not raise feet towards the dome of a temple. The basis of Indian food consists of two types of grains: in North - wheat, and in South rice. In the North, wheat is used for making bread called chapati cakes that accompanies a mainly vegetarian cuisine (Rajasthan). Many vegetables are tasty and accompanied by sauces and cheese cubes. In the South, fragrant rice with spicy vegetable curry, trying key elements in its traditional form of 'thali' a large banana leaf where all the ingredients are shown to be mixed and eaten with the fingers. A taste, tandoori cooking (meat or fish cooked in a small clay oven). Across the country, fruit and local pastries are very popular. Meals at hotels and restaurants are often served buffet style which allows you to enjoy a wide range of culinary India. Valid passport for at least six months after the return date. Mandatory visa obtained prior to departure from the embassy or consulate with the VF Services, responsible for collecting and returning the visa: 42/44 rue de Paradis 75010 Paris. The visa is valid for 6 months from the date of issue. Form to be completed directly on http://www.vfs-in-fr.com. Information relating only to the holders of French passports. For all other nationalities, check with your embassy. Winter +4h30 over Paris; summer 3h30. The national currency is the Indian rupee (INR or Rp) divided into 100 paisa. The currency is in denominations of 1, 2, 5, 10, 20, 50, 100, 500 and 1000. Euros and Dollars can be exchanged at most hotels and banks. Have a maximum of small currency notes to pay for purchases. All credit cards are accepted in hotels and most shops and restaurants. Always retrieve your shopping receipts and keep your exchange slips to convert your rupees leaving India. ATMs are becoming more common in large cities. In No vaccinations are required for India, but it is recommended to be up to date diphtheria-tetanus-polio. Other recommended vaccinations: typhoid and hepatitis A & B and. Antimalarial prophylaxis is recommended in some areas. Consult your doctor or international vaccination center of the Pasteur Institute (tel: 0890.710.811). Country information on the website of the Institut Pasteur: http://www.pasteur.fr/fr/map. The above information is given for guidance. They are subject to change by your departure, ask to prepare your trip. Carry your personal medical treatment and what fight against stomach and intestinal disorders. Provide protection against mosquitoes and biting often against the sun. It is highly advisable not to drink tap water, eat vegetables or fruit that you have not you removed the skin. Beware of air conditioning for hotels and always have a scarf to protect your throat temperature differences with the outside. The voltage in India is 220 volts. Outlets are in principle European style hotels but for some, it is advisable to bring an international adapter strip. Keep a flashlight in case of power failure in some remote areas. In India, people drive on the left. Rent a vehicle without a driver is not recommended because of the density of traffic rules and it's quite different from European standards. In India, the practice of tipping is widespread and accepted by your guides and drivers. It should not be seen as a constraint, but as a reward for services rendered. Its allocation and the amount is left to your discretion. As a guide, we suggest you allow between 8 and 10 € per day for the guide (depending on whether a local guide on a step or a tour guide for your trip) and from 3 to 5 € per day for the driver. In hotels and restaurants for employees (porters, waiters, etc..), you can thank them directly (expect between 0.5 and 1 €). Purchases can be made in large state stores (State Emporium) where prices are fixed or in small shops and bazaars where it is customary to bargain. You can find cotton fabrics, silks, miniature on silk or paper, wood sandalwood, wool rugs and silk, silver jewelry and precious or semi-precious stones, marble objects, paper mache boxes ... India is very rich in crafts of all kinds, a true paradise for the buyer. The opening hours of shops vary from one region to another, but most of them open around 10:00 and close at 19:00 every day except Sunday. Banks are generally open Monday to Friday from 10:00 to 14:00 and Saturday from 10:00 to 12:00. Bring light and comfortable clothes but think of a few jackets or sweaters for the cool evenings. Shorts, short skirts, necklines and bare shoulders are strongly discouraged for women. Provide swimwear to enjoy the hotel pools. It is not easy to describe the climate of a country as vast: you can however be summarized into three distinct seasons: a hot, a wet and a winter season. The winter or dry season, from October to March, is the best time to visit India. The weather is dry and sunny, and the average temperature is 25 ° C. Temperatures drop significantly in the North between December and January, while in the South they remain soft. In summer, from March to May, experiencing peak heat above 35 ° C. Wet weather in the South. With the exception of the extreme North, India has a tropical climate and knows the monsoon. It begins in late May with heavy rain, storms and tempests, going gradually from South to North, and extending throughout the country, and was completed in October, except on the south-east coast where it is more virulent between October and December. The best time to visit India will be based on selected regions, although the period from October to March is the best time for most of them. If you visit the North-East, Kashmir or the mountains of Himachal Pradesh, however, prefer the months of April to September.